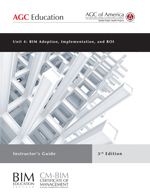 A full day course designed to provide a neutral introduction to BIM tools. Tools are introduced as they relate to the functions they perform, as well as particular phases in a project where they have the strongest capabilities. Instructors will cover a four-step process of software selection that participants can use as they start the BIM software-purchasing process. The course concludes by examining file formats, compatibility, and emerging technology, and how they work together to transform the industry.